There are many different types of pet snakes, but which ones are for beginners and make the best pets for everyone? Most experts recommend that you start out with small pet snakes and smaller less aggressive species, so that you get used to taking care of them and handling them properly. There are some snakes that do not make good pets at all, even for experienced handlers, and these are the larger constrictors and pythons which can get huge. There are many snakes which can be found on almost every list of the best types of pet snakes, and these are chosen for their temperament, their smaller size of approximately five or six feet long at maturity, and their ease of handling and care. 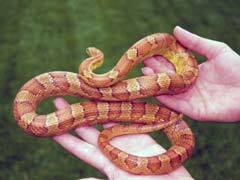 One of the top snakes to own can be pet corn snakes. This species can include a wide range of colors, and they are usually docile and easily tamed. These snakes very rarely bite, and then only when severely provoked. A list of the best types of pet snakes should also include the gopher snake. This snake has beautiful markings, and one of the best temperaments out of any snake. Ball pythons also make great pets, except in one area. These snakes can be somewhat finicky, and may or may not eat frozen and thawed for. Some of these snakes will only eat live food, and this can be inconvenient for some owners. Before you go out and purchase pet snakes for sale on a whim it is important that you think about your decision, and do some research. You will need to determine which types of pet snakes are the right ones for you, your home, your time, and your financial situation. It can be costly to set up and keep a snake properly. There are a number of expenses and pet snake supplies that you will need to care for your pet, and these should be purchased and be ready when you bring your new snake home. A kingsnake can also make an excellent first pet for most people interested in owning a snake.